Our roads have a prominent physical presence, connecting major destinations in our cities and carrying millions of road users each day. We strive to limit our physical impacts to the immediate road corridors where we operate. During and after major works, we seek opportunities to rejuvenate roadside land to improve its environmental and community value. In the spirit of our vision to strengthen communities through transport and as part of our commitment to sustainability, we launched a public competition looking for innovative ideas to transform the Power Street Loop site near our Domain Tunnel in Victoria. The transformation of the Power Street Loop - a vacant site at the gateway to Melbourne’s vibrant, world-class arts precinct - is one of our key sustainability projects this year and once completed it will make a positive contribution to the cultural landscape of the Melbourne’s arts precinct. We challenged teams of creative students and professionals to collaborate and come up with creative design elements and artistic solutions that could breathe new life into the site. This ideas competition was designed in consultation with Landcare Australia, Victorian College of Arts and Arts Victoria. Landcare Australia was also engaged to direct the ecological regeneration of the site, which will be replanted with native species. In March 2015, an awards ceremony was held to announce the winners. The entries showcased a high level of artistic ingenuity and commitment to sustainability. The Major Prize went to the sustainable and environmentally considerate design ‘Habitat-Filter’ by design professionals Drysdale Myers and Dow, which beat 53 entries to win the $20,000 prize. View a short video about the idea below. The judging panel also awarded sub-prizes in sustainability, innovation and artistic categories. The Best Sustainable Idea was awarded to ‘Territory’ by Perth-based landscape architects Jeremy Wilks and Jennifer Cooper who designed a living sculpture that incorporated ecology, art and technology. See video of the idea below. The Most Innovative Response to Site prize went to ‘Driving Neutral’ by PWR Ranges, comprising Melbourne-based landscape architects Anton Malishev and Tom Reynolds and environmental sustainable designer Sian Willmott. Their idea incorporated an interactive visual representation of a community’s carbon footprint with a focus on encouraging sustainable modes of transport such as walking, cycling and running. See video of the idea below. The Most Artistic Prize went to ‘The Beans’ by ARC-Up, comprising Melbourne architecture students Joshua Stellini, Rose Fan, Bryan Fan and Scott Walker. Their idea of a carbon-positive sculpture using algae as an alternative power source was described as “a commentary on Melbourne’s loathed and loved roadside sculptures”. See video of the idea below. The winning ideas and all entries were displayed at a free exhibition at the Testing Grounds site in Southbank for a week following the awards. Transurban has engaged design and construction contractors to investigate the feasibility of the winning designs, with the intention to refine these concepts and consider development of the site in FY16. Transurban has formed a national partnership with Landcare Australia, a community-driven organisation that aims to protect, restore and sustainably manage Australia’s natural environment and productivity. As part of this partnership, Landcare will be a consultant and services provider for the revegetation and development of key Transurban sites. The first initiative of this partnership is the Power Street Loop located in Melbourne, where Landcare has provided a revegetation plan for the disused earthen mound. This revegetation project is supported by our Power St Loop ideas competition to place an iconic piece of art on the site, which is within the Melbourne Arts Precinct. The site will be revegetated with indigenous species which historically occurred in the area, with the aim to restore the site habitat more closely to its original state, restore lost habitat and improve the biodiversity of the area. This project is a unique opportunity as it demonstrates urban land care in the heart of the city, making use of confined or under-utilised urban spaces. The project will also have additional environmental benefits including reducing air pollution and mitigating the urban heat island effect, with natural vegetation reducing localised day time and night time temperatures. Following on from the success of the Power St Loop project, Transurban is now looking to other road sites for environmental rejuvenation and creative community development. 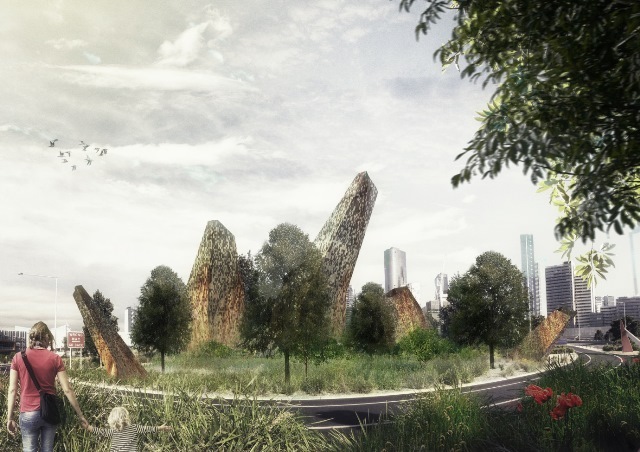 A site alongside our M2 motorway in Sydney’s Macquarie Park has been identified for revegetation, and the project will now include a creative design competition to allow community input for an iconic public art installation. The project aims to create a habitat to complement the ecology within Lane Cove National Park, which is immediately north of the site. It would provide an ecological ‘buffer’ to the Park. In addition, the waterways to the east and west of the site are to be enhanced to improve the quality of surface water draining into the national park. This will be a permanent ecological legacy and the regeneration efforts will be maintained over the remaining duration of Transurban’s concession deed to ensure that the value of the legacy is not diminished. The development of public art on the site will again be driven by community-submitted ideas that may include a range of urban designers, landscape designers, universities and members of the artistic community. In FY15, we held discussions with NSW government stakeholders, as well as Landcare to discuss the opportunities for the site. Our intent is to begin the ideas competition and conceptual designs by the end of 2015, with the iconic artwork installed and substantial progress made with the regeneration by the end of 2016. The 1,000 Trees in 1,000 Days program started in 2012 when 95 Express Lanes construction began in northern Virginia. In November 2014 as construction neared completion, we reached our commitment to plant all 1,000 trees. With our design-build partner Fluor, we aimed to minimise impacts of 95 Express Lanes construction, but the project required removal of trees and brush along the roadway. The 1,000 Trees program was created to return greenery to the area. Through the program, we partnered with 17 local organisations and communities to plant trees. The 1,000 Trees in 1,000 Days program helped organisations such as Fred M. Lynn Middle School, St. Francis of Assisi Catholic Church and several neighbourhood associations in planting trees throughout communities surrounding the project corridor.